You have to love the new trend in weddings–handmade and DIY. It’s so wonderful to see bridal couples putting such a personal touch on their big days! Here’s a quick project for brides to add add to their arsenals for diy wedding party cracker favors. Each one takes less than 5 minutes to make, and with an assembly line, they’ll be done in a snap for large quantities! This is a Craft Lightning project; be sure to check out the rest of the quick make wedding projects at 30 minute Crafts and Country Chic Cottage. Old wrapping paper tubes and toilet paper tubes work great for the carboard tubes required by this project. You can use a variety of papers, but I find crepe to be the most pliant. If you want a proper snapping cracker, you’ll have to include a cracker snap, but they’re lovely without this addition as well. I’ve put an affiliate link below for you to see where to buy a few if you go this direction. Place the cardboard roll in the center at the edge of the crepe paper. Roll the tube completely in the paper, then fasten with double stick tape. Twist one end of the tube shut. Add your cracker snap to the tube now if you plan to use them! Fill the tube with candy or whatever other favor you plan to give then twist the end shut. Print and cut out the thank you labels. Wrap around the middle of each tube, securing with double stick tape. Cut pieces of glitter tape to fit around each tube, and adhere to either side of the printed label. For added flair, tie ribbons to the ends of the tubes and these party cracker wedding favors are ready to go! These favors can also easily be used for showers or any other kind of party you’re hosting. 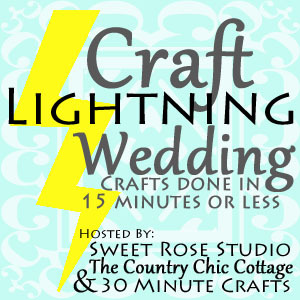 Don’t forget the rest of the Craft Lightning fun by clicking the link below! Love these! thanks for joining! OMG Paula, crazy party minds think alike! I posted a DIY for patriotic poppers today too! I absolutely love these! What a great idea. So pretty! I’d love to see them filled with glitter. Thank you for sharing this week at Brag About It link party on VMG206. How wonderful!! Thanks for sharing at the #HomeMattersParty – We hope to see you again next week!